Sonata in Z is a ‘gentle space’, inspired by my autistic hyper sensory quest for sanctuary, and my Greyhound Lucy’s natural ability to seek out and create oases of comfort. Unfolding like a musical sonata, visual images of Lucy in sonorous repose introduce the theme of rest. Please leave your shoes at the threshold as you enter, symbolically shedding conventional notions of social communication. Once inside, we shall not speak in words, but the tranquility is neither silent nor empty, because our senses will lead the way into a different social ecosystem of softly undulating rhythms, patterns, sounds, movements, gestures, textures, smells, tastes and visual conversations. This is our refuge, an alternative empathic resonance, a nonverbal sensory equilibrium – and Lucy and I would like to share our clement space with you. Apart from the evocative photographs of Lucy, there was a catalogue of installation objects for sale. All proceeds from sale of these items were donated to mindDog Australia, in recognition and thanks for the wonderful work this charity organisation does for people in need of psychiatric assistance / service dogs. This exhibition raised AU$791 in total for mindDog Australia! Thank you for your kind and generous support! Sonata in Z (2015) completes a trilogy of physical studies in Autistic Parallel Embodiment and elemental empathy. The preceding two exhibitions – Roaring Whispers (2013) and Little Sweets 小甜心 (2014) – presented confrontations with the eclectic cacophonies of my autistic existential oxymoron. As a cadential resolution to the three-part opus, Sonata in Z unwraps sensorial equilibrium and tranquility. Prevalent social autocracy demands a performance of conformity, creating stressful unnatural dissonance for the autistic individual. We (autists) are pronounced ‘high’ or ‘low’ functioning according to how well we manage to mimic the prevalent social libretto, the latter of which is based on a system alien to autistic modalities. In Sonata in Z, social communion emanates from within natural autistic dimensions of sensory contentment and elemental symbiosis. Lucy is my artistic muse. The quintessential connection between autist and animal lies not in any need for anthropomorphism. In fact, Lucy’s disparate sentient presence, and the unembellished juxtaposition and sympathetic reverberation of our canine-and-human coexistence reify my concepts of autistic parallel embodiment and alternative empathic channels. 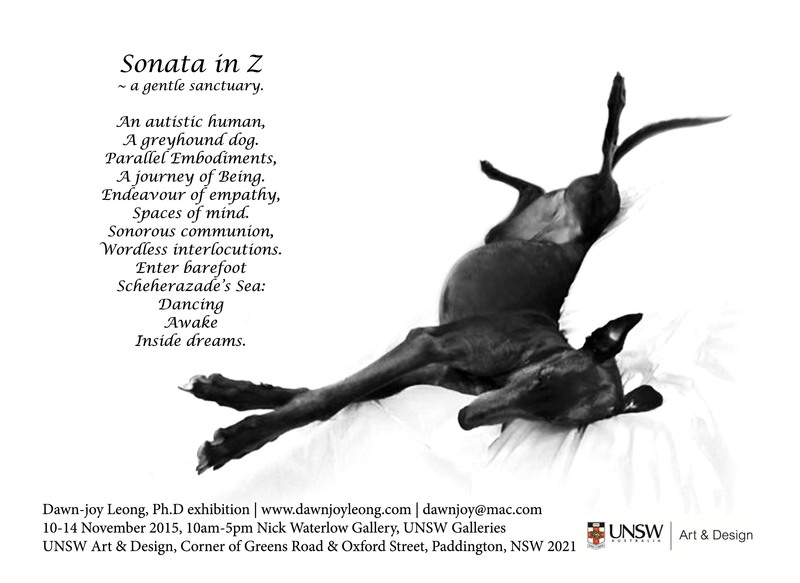 Drawing upon the well-documented connection between autistic persons and animals, Sonata in Z is directly and specifically inspired by Lucy’s innate and inexorable genius at situating and establishing comfortable refuge. The first part of the title is a nod to one of my favourite musical forms, the Classical Sonata, which speaks to me of order, process and ‘becoming,’ and the “Z” is a whimsical reference to Lucy’s favourite activity, i.e. mellow reposing! It suggests the symbiotic relationship between an autist and her canine companion: a testament of empathic resonance across diverse incarnations of Beingness. Like a musical theme, photographs of Lucy in sonorous repose lead the way into the space, wherein a synergetic human-and-canine symbiosis unfolds. Inside, a continuous performance is taking place. Performance is an inevitable and essential part of autistic life within an alien social world, where autists are required to “perform the unnatural as naturally as possible.” The rendition in Sonata in Z, however, is a different kind of expression. Here, the autist-as-artist shall unfold the intrinsic: there shall be no verbal chatter, our communication shall be nonverbal, yet rich in the language of concrete consciousness. As soon as you remove your shoes (which shall be a requirement of entry) and step into this intimate interstice, you shall become part of its dynamic essence and rhythmic momentum. Explore, experience and luxuriate in myriad textures and patterns; curl up inside Lucy’s special Cuddle Cave, even fall asleep to the soundscape of her reassuring heartbeat and rhythmic breath; indulge in delicious tastes and smells; or join me in non-verbal calming ‘stimming’ activities and parallel-interaction, fashioning new objects to add to the luscious sensory tapestry each day. Sonata in Z is an invitation to tune in to intrinsic autistic empathies: suspend entrenched assumptions, enter into an alternative reality, a clement interstice, and become part of its dynamic essence and rhythmic momentum, where the vibrant language of sensory consciousness becomes the lingua franca.